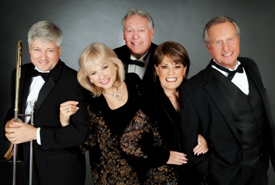 THE MODERNAIRES are an extraordinary vocal harmony group & are celebrating over 80 years in show business. There have been many changes in personnel over the years, and many changes in music. Today they are mixing it up, still singing the songs that made them famous including "Chattanooga Choo Choo" & adding beloved classics from the American Songbook. Their biggest break came in 1939 when the great Glenn Miller “borrowed” them to record a tune called “It’s Make Believe Ballroom Time,” a sequel to the original “Make Believe Ballroom." Glenn Miller was sold, and soon after, The Modernaires became an important part of the most popular big band of all time. When Paula Kelly (Mrs. Hal Dickinson at that time), joined the Miller band and recorded with THE MODS, it was the beginning of a group that is still popular today. JULIE DICKINSON, who is the youngest of the three daughters of The Modernaires’ Paula Kelly and Hal Dickinson, is the lead singer. JOE CROYLE (Peter Marshall's "(Chapter Five"); JIM STEPHENS (Late Nite Big Band); GINGER BERGLUND (Steve Allen) & SCOTT WHITFIELD (Johnny Mandel) round out this very talented vocal harmony foursome.